I have often been frustrated by the crude characterisations that abound in relation to different types of fats, since I learnt in my biomedical degree studying nutrition, that most fats are a mixture of several kinds of lipid molecules, often evenly split across 3 kinds, or at least with a significant percentage of a lipid that is not commonly thought of in relation to that particular dietary fat. We tend, for example, to talk about olive all as being monounsaturated, but ignore its 21% content that is polyunsaturated linoleic acid. Recently while looking up some fats on the web, I was struck by this table below which appears on the Wikipedia page on Suet. I cannot find who made the table, but I hope they do not mind me reproducing it here, appropriately credited. Saturated fat = 91g/100g; Monounsaturated fat = 6g/100g; Polyunsaturated fat = 3g/100g; Smoke point = 350 °F (177 °C). I find this kind of comparative data useful also because it shows quite clearly something that many nutritional biochemists and evidence-based nutritional bloggers have been trying to get people to understand for years now: That industrial seed/plant oils are not healthier just because they have minimal saturated fat in them. On the contrary, what they have instead of saturated fat is polyunsaturated fat, usually of the Omega 6 variety which is pro-inflammatory and which has been found in large long-term meta-analyses to correlate with an increases in dislipidemia and in cardiovascular disease deaths. All polyunsaturated fats also oxidise VERY easily (often in the pan, if not already in the bottle), producing oxidative stress in our cells when we ingest them. So, even if you are not convinced that saturated fat is great to eat large amounts, you would have to be crazy to swap it for an Omega 6-rich oil, as so many do in choosing margarine over butter and sunflower oil over lard. In fact, counter-intuitively, the higher the saturated fat in these relatively bad oils is, the less they are probably bad. This is because the saturates prevent, to some degree, the oxidation of the polyunsaturates. Hence, if I had to eat any of these seed oils, I would choose the rice bran over the canola. Frankly though, I see no reason to touch any of them with a 10-foot barge-pole.....Anything with upwards of 30% Omega 6 is just asking for trouble if it appears regularly in your diet. Smoke point is also worth a look for thinking about how you use a particular fat - note for instance that butter has a low smoke point, which means frying stuff with it at anything higher than the lowest of low flames for longer than a minute will produce known carcinogens of the acrylamide variety. This is true of all high-temperature frying, but the lower the smoke point of a fat, the easier it will be to destroy its molecular structure and create something of unknown potential risk. Seed oils became popular in the first place because of their capacity for high-temperature frying, but given they are so toxic in the first place, this is really a bad idea. If, like me, you love your butter and your olive oil, consider smothering them on after the food has cooked, rather than frying stuff with them. And if you are determined to eat something crispy and fried as an occasional treat (like me! ), use a high smoke point saturated fat to fry with, and accompany it with plenty of anti-carcinogens, including raw garlic (for the allocin), cruciferous and other sulphurous veggies (for the indoles and hepato-protective phytochemicals), and turmeric (for the curcumin), knocked down with a small glass of Bordeaux or Shiraz (for the resveratrol) or a cup of green tea (for the polyphenols). Inflammation is grossly underestimated by most doctors and health-conscious people. There is still a common tendency to think that those with cardio-vascular, metabolic, auto-immune and neurological diseases are best off eating a low fat diet that includes grains, vegetables oils and low-fat dairy, and without any concern about processed food. High fat diets are still being blamed for most things in spite of any controlled studies that show this variable to be causative as distinct from others. But there is a lot of evidence pointing the other way. I could ramble on here about this but I think a number of professional biochemists, physiologists, micro-biologists, and scientifically-informed nutritional experts, have already done a great job of explaining why inflammatory triggers may be the more important things to watch out for in eating well for many forms of chronic disease. If you have no idea what I mean by "anti-inflammatory" relative to diet, I recommend checking out the research biologist Art Ayer's blog, Cooling Inflammation. I don't eat a particularly inflammatory diet as it is (in that I eat no vegetable or seed oils, no grains, no processed foods, no sugar, and lots of fresh vegetables, fatty fish and only nutrient-dense low-fructose fruits), but in times of mild gut disorder, fatigue or auto-immune revisitation that can occur from restaurant meals or work stress, I find it helpful to correct imbalance by stepping even further away from things that are usually in my diet that contain omega 6 fats (eg. most nuts and dairy, as well as land-animal fats) or that contain other common inflammatory triggers (eg. eggs and dairy). When we think of smoothies in our house, we tend to think of creamy, eggy, thick, liquid protein meals. 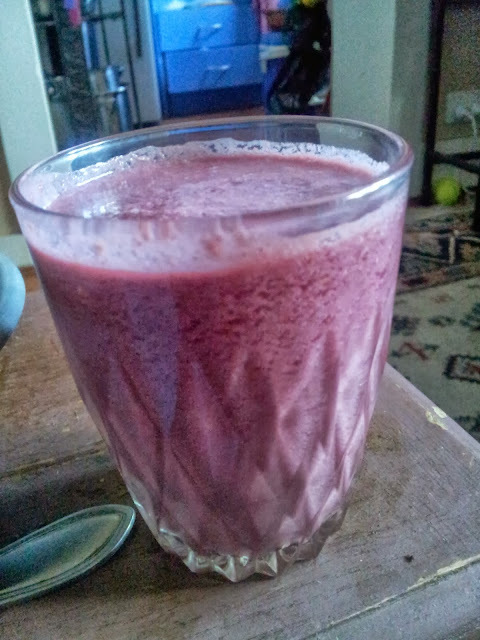 But this lighter non-dairy, non-egg smoothie has its own unique appeal for its anti-inflammatory freshness (anthocyanins and other anti-oxidants in the berries, polyphenols and phytochemicals in the mint and green tea), soothing fats (omega 3 and medium chain triglycerides) and diverse probiotic support in the kefir. I don't look at the acai here as some kind of "superfood", the way it is often hyped. But it is fantastic for increasing the berry intensity AND lipid content of a smoothie (not many things can make that dual claim!). Walnuts are my preferred smoothie nut because they have a relatively higher omega 3:6 ratio, ditto chia seeds. Coconut cream is a true godsend for fatty lusciousness on a non-dairy regime. Kefir grains do a nice job on coconut water, though they need to be left a little longer than milk kefir if you want those micro-organisms to gobble up all the sugars for you. After 2 days in the yogurt incubator I get a nice fizzy, sour kefir, which then keeps for up to a week in the fridge. It works well with the berry tones of this smoothie. This smoothie is really fresh and delightful. The quality of the Brie cheese is obviously crucial. I used a rich creamy organic handmade large round from Adelaide Hills Udder Delights (featured on my favourite fatty products page). The crust uses Living Intentions organic Sprouted Buckwheat/Almond flour, mixed with organic NZ pastured butter and one pastured free-range egg. This does NOT make a kneadable dough. It makes a moist lump that can be pressed into a butter-greased ceramic pie dish. Once it is pressed into the dish, I moisten the outer edges of the dough with a little water, then let it bake in hot oven for just a few minutes to dry out the crust on the base. Sprouted non-cereal flour does not actually need to cook in the way cereal flours do, so it is more a matter of drying it enough to lose the stickiness of the dough. 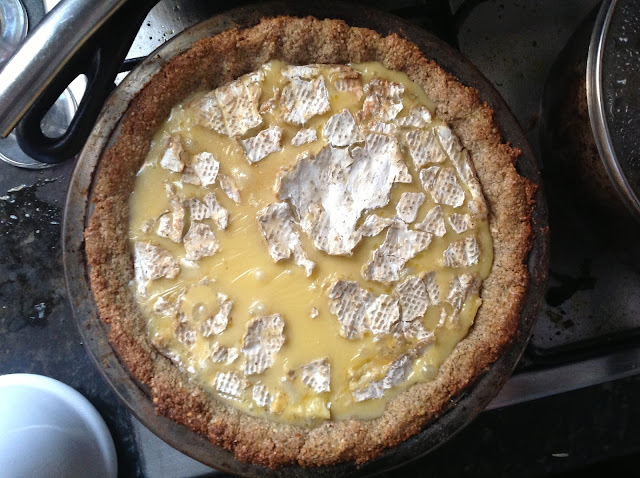 The Brie is then placed in the middle. The dish ideally should be only slightly bigger in diameter, but if the Brie does not come all the way to the edges of the crust, it can be pressed down a little to spread it (especially if it is a nice fat Brie). Leave this in oven until the Brie starts to look shiny and runny, and the pie crust edges have browned just a little for that nice toasted flavour. Then whip it out and let it rest a few minutes. You will need a knife to slice it and a spatula to scoop it out. It will fall apart a bit on lifting the slices, but who cares....? I serve it with fresh organic unwashed rocket over which I drizzle a good fruity organic olive oil. This dish will keep in the fridge for a few days and can be gently rewarmed. I am inclined to eat it on the first melt though, since these sort of cheeses can start to fall apart in their molecular structure on multiple heatings, and you may end up with an oily residue alongside a grainier cheese mass. This is inoffensive but hardly the nirvana of the original delight. The current scientific theory is that sleep and wake cycles are entrained by light, via the retina, activating pathways in the suprachiasmatic nuclei of the hypothalamus. Hence modulation occurs gradually, as per the shifting light availability of the natural seasons, and complete reversals of sleep and wake cycles cannot be achieved solely through light stimulus. I have done a lot of long haul international flights, typically between Australia and Europe, some between Australia and the US or Europe and the US, and for most of my life I found that I adjusted fairly easily to the new time zone. In recent years though, it has become trickier. My circadian rhythm seems more set and unwilling to budge. I had also been inclined to work on my academic research late into the night, sleep late of a morning, or not sleep enough. On the whole, I would say that my respect for sleep hygiene and consistency throughout my adult life has been quite woeful. This became a real problem in my last overseas trip when I spent much of the first week in a completely discombobulated zombie state in London, unable to sleep through the night, and wanting to curl up on a warm fluffy rug when I had instead a cold hard library seat beneath me during the day time. It didn't seem to be getting any better after 4 days and I started to feel a bit desperate. I had not brought any melatonin with me, but in any case had doubts about its bioavailability in supplement form. I tried meditating before bedtime, not eating heavy foods at night, not drinking coffee after midday, doing hypnotic meditations in bed when I could not sleep. I felt lovely and relaxed, present and still. But the new required sleep pattern yet eluded me. I was studying for a physiology exam in my biomedical science program and actually learning about biological rhythms. It dawned on me suddenly that since there are more and more people travelling across time zones than ever before, there must be some good new scientific research on this exact problem. The article that most peaked my interest was this one, published in Science on May 23 2008. doi:10.1126/science.1153277. When food is plentiful, circadian rhythms of animals are powerfully entrained by the light-dark cycle. However, if animals have access to food only during their normal sleep cycle, they will shift most of their circadian rhythms to match the food availability. We studied the basis for entrainment of circadian rhythms by food and light in mice with targeted disruption of the clock gene Bmal1, which lack circadian rhythmicity. Injection of a viral vector containing the Bmal1 gene into the suprachiasmatic nuclei of the hypothalamus restored light-entrainable, but not food-entrainable, circadian rhythms. In contrast, restoration of the Bmal1 gene only in the dorsomedial hypothalamic nucleus restored the ability of animals to entrain to food but not to light. These results demonstrate that the dorsomedial hypothalamus contains a Bmal1-based oscillator that can drive food entrainment of circadian rhythms. This paper is well worth a read. But if you want a quick overview, there is a nice radio interview about it here. Basically, animal studies have shown numerous examples of circadian rhythm reset based on fasting and food reward. And even though there are no human studies on the phenomenon, I figured it was low-risk and that I had little to lose giving it a try. 1. Do not eat anything for at least 12 hours, preferably 16 hours prior to the hour you want to be waking up. I wanted to wake up at 7am, so I ate nothing after 2pm. Drinking water is still necessary. And I would say weak tea with no sweeteners or milk or anything is fine too. Just don't drink anything with much in the way of calories OR taste reward. 2. However well you sleep that night, get up at your target time the next morning and immediately eat a large, highly calorific, delicious and rewarding breakfast. As in, go to town....Pig out....Treats unrestrained.... Personally, though I stuck with lipids as my primary choice of mega-calorific rewarding yum. I ate a plate full of prawns cooked in coconut oil, buttery green vegetables, and sourdough buckwheat pancakes with clotted cream and fresh berries. I actually ate such a large amount of food that I didn't even feel the need for anything much for the rest of the day. On the night of the pig-out day I got sleepy around 9pm, went to bed and slept through a full 9 hours for the first time in a week. It felt wonderful. Thereafter, I had no trouble sleeping at night and waking up in the morning. My partner then arrived in London and tried the same thing. He got duck confit in his high reward/high calorie breaky....and slept like a baby every night thereafter. I tried it on myself again on returning to Australia. Bingo again, instant reset. After years of battling to go to bed early and wake up in the morning, I am now finding that I have no problem whatsoever being an early riser and falling asleep as soon as get into bed at night. If I start to drift in my sleep pattern, I just go back to the fasting-reward tool for a night, and it slots right back into the rhythm that I want. This is such a powerful and simple trick, I cannot believe more people do not know about it. Spread the word, and if you know someone struggling with sleep pattern regulation, make sure they know about it too. 2 things are crucial: Firstly, there must be a complete fast for 12-16 hours prior to the wake-up time, and secondly the breaking of the fast must be highly rewarding and calorific. Kai-Florian Storch,and Charles J. Weitz (2009). ‘Daily rhythms of food-anticipatory behavioral activity do not require the known circadian clock’. PNAS vol. 106 no. 16: 6808–6813. doi: 10.1073/pnas.0902063106. This article has free open access and is linked here. Ralph E. Mistlberger, Brianne A. Kent, Glenn J. Landry(2009). ‘Phenotyping Food Entrainment: Motion Sensors and Telemetry Are Equivalent’. Journal of Biological Rhythms Vol.24, No.1: 95-98. doi: 10.1177/0748730408329573. 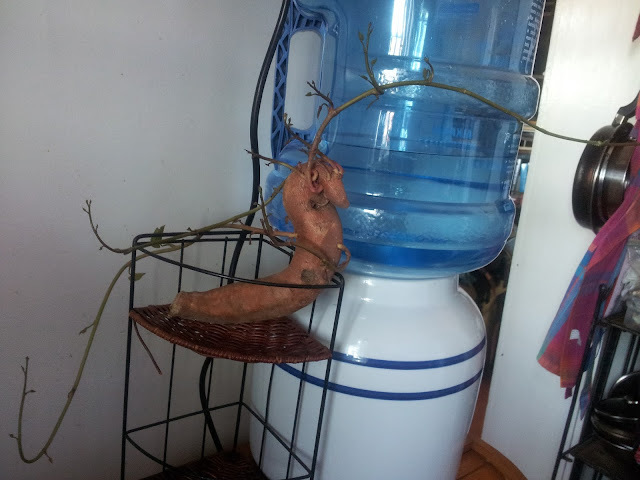 Root Vegetables are Pets not Food! The rare tentacled chariot kumera sea-pony that lives near water, but not in it...How could I go back to eating starchy tubers after returning from holidays to find this in my kitchen? Surely such a magnificent creature has an irrefutable right to life? Surely something with such a will to live should not be slain for my mere nutritional benefit? I make no apologies. Eating this way is amazing. I feel completely sorted for the whole rest of the day. It probably seems extravagant, but it was actually very easy to prepare. The trick is my trusty old slow cooker crock. Just plug it in and leave it, and wake up, or come home, to something that smells amazing. The goose or duck fat is a little pricey, but can be re-used after straining. I don't eat this way every day, but for a treat now and then, it is nice special yum. I have some reflections on sumptuousness and emotional eating on another page. So I bought frozen organic pastured duck filets (2). After defrosting them for a day in the fridge, I smothered them with salt, rubbing it into the flesh. Medium course sea salt is best for this. I used Himalayan rock salt this time, but it is actually a bit too strong. Sea salt is milder. So the salted filets then go back in glass bowl, covered, and left in the fridge for 24 hours. The next day, I remove the filets, wash them thoroughly to remove all the salt, and actually, it is probably better to let them sit in some fresh water afterwoods for 10-15 minutes too. I neglected that step and ended up with confit that was still delicious but a bit more on the salty side than I prefer (my salt taste tolerance is quite low because I didn't eat it at all for years). The filets are then patted dry with a cloth (don't use tissue - it will stick to it). I then put them in the crock pot side by side with the fat side down. I poured about 300g of goose fat over them (duck fat of course is fine too), just enough to cover the filets. I turned the cooker on its higher of the 2 settings and left it for about 4 hours. The time is not crucial. It might only need 2 hours, or you might leave it for 6 and still have a great result. The minimum is the time it takes for a fork to pass through the filets with no resistance. Then they are cooked. I removed the filets, strained the fat through a fine sieve, then poured it back over them in a glass bowl. Refrigerated this covered until the next day but actually you could just leave it there up to a week or until you want to eat them. There is a traditional technique for storing them for longer (up to a few months), but I will explain that another time. On the morning of reckoning.....I fished the filets out of the fat and cooked them on low heat in a cast iron pan covered (for about 15 minutes) until the fat-side was browned, then turned them over and cooked them until and other side was warmed and sizzling. I ensured that the fat on the duck was browned on all sides and crispy. While that was happening I chopped 2 Asian shallots, and the stems only of 3 baby bok choy, added a dash of tumeric and some cracked pepper, and I sautéed these in another cast iron pan using some of the goose fat. I added 2 cloves of crushed garlic and the baby bok choy leaves just in the last 30 seconds, covered. This is just the time for the leaves to wilt slightly and the garlic to warm and release its flavour into the fat. That's it. Garnished with a mouthful of beetroot/cabbage sauerkraut and sprinkle of unwashed organic ripped-up parsley. If you like bacon and you have never tried confit.....you are missing out. The crispy skin is absolutely in the bacon genre of superlative delectability, only better. Need I say more? Prawns are breakfast food in our house. There is something about the non-conventionality of it that makes us both grin every time someone proposes it. A protein breakfast has been a valuable tool for me in overcoming sugar addition. I always found that when I ate porridges and mueslis and fruits for breakfast all those years, it really left me down and out within a few hours and I was back on the hunt for more quick carbs. Even if I managed to resist the urge for sugary treats, I still always had the sense that my REAL nutritional needs (for good fats, phytochemicals, and protein) were yet to be addressed. And if I got busy during the day, I could easily end up missing out, not getting around to eating until I was really hypoglycemic and then just pouncing on the first fragrant hot food I came across. In this meal, I feel like I am ahead of the game from the word go. It is only 7:30am and I have already had much of my protein requirement for the day, most of my carbohydrate in the form of 4-5 different coloured vegetables, and a nice amount of the kind of fat (medium chain triglycerides) that is used directly as metabolic fuel. I could pretty much just eat some nuts, some butter and an egg from this point on until I go to bed. That is damn handy on days when I am out teaching or in meetings or in a library and don't have access to my kitchen to cook a nutritious lunch. 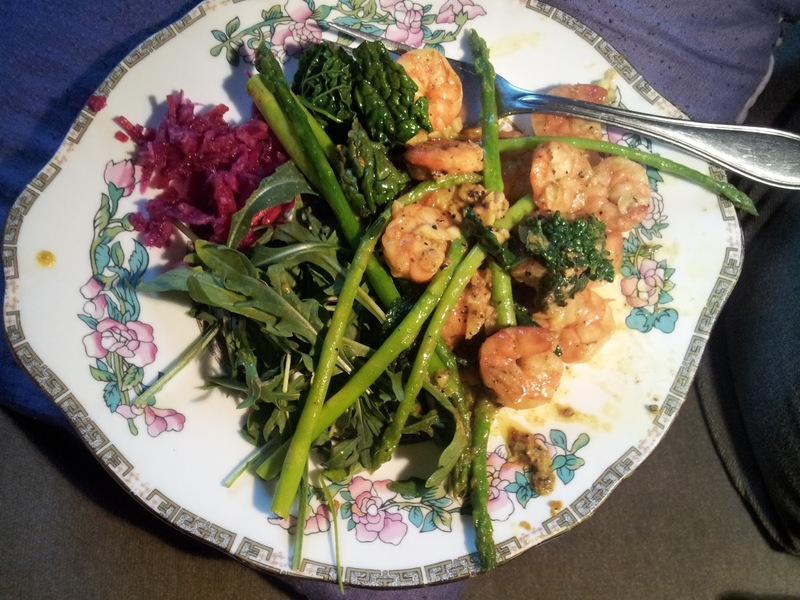 In this version of the breakfast, I have king prawns, spices, coconut oil, baby asparagus, Tuscan cabbage, dulce seaweed flakes, garlic, rocket, and beetroot sauerkraut. The amounts are for 2 people. It is very quick. I buy the prawns raw but shelled direct from a fish market (about 200g). I chuck them in pan on medium heat with 3 tablespoons of coconut oil and a generous amount of turmeric and black pepper, then reduce the heat after the first minute, let them sizzle for another 2-3 minutes while I get the vegetables out of the fridge. Then I turn the prawns over one by one (or as carefully as I could be bothered), and throw in the baby asparagus and the Tuscan cabbage. I will have crushed my garlic at least 15 minutes ago and now throw that in as well along with the dulce flakes. I always buy my rocket organic - it keeps for several weeks in the fridge, compared to store bought stuff that only lasts a day or so before looking yellow and floury. I didn't make this beetroot sauerkraut myself, but I do make such things sometimes. It is a nice way to get the sweet vegetables that are otherwise ill-advised on a low carbohydrate diet because the micro-organisms in the sauerkraut consume most of the sugars and leave you with a nice sour, tangy fibre-rich probiotic and prebiotic food that adds a splash of colour to the plate. I recently found nice a source of organic lamb's liver. I like eating organs in part too because they are so often thrown away in favour of the blander parts of the animal's flesh. For every 1 liver eaten, a multitude of lambs are slaughtered for their muscle alone. Like a scavenger picking up the scraps, I like the thought that I am making use of the discarded parts, the secret elixir of life, while the fashionable but nutritionally-impoverished muscle meats are chewed away at by the stylish but ignorant. Lamb liver has a delicate flavour, is a gentle pink tone and a nice size for a 2 person meal. Chris Masterjohn has some helpful advice on keeping the flavour of liver fresh - use grass-fed animal onlys, buy it frozen and use it as soon as it is defrosted. I soak it for 20 minutes in milk, since casein causes the blood to coagulate so that the liver does not bleed much when cooking. I remove any tough sinewy bits of membrane as much as possible and cut it into small chunks. I trim the fat from some bacon (about 200g for every liver) and melt it in a cast-iron pan on low heat, removing the crispy browned parts and nibbling them as I cook, then cooking the chopped bacon meat along with 2 finely chopped green zucchinis in the fat. If it is not already VERY fatty then I add a little butter to it as well. I keep everything LOW temperature. It takes a little longer but is yummier and avoids carcinogenic activity that increases with temperature in dry cooking of saturated fats. I season with turmeric and black pepper, and in the last minute of cooking I throw in a generous amount of crushed garlic (always left to sit for at least 10 minutes before it goes in the pan). I serve this on top of butter-lettuce leaves. It is one of those breakfasts that makes lunch seem pretty optional. My idea of a "dessert"